Cabin fever season: when the cold drives people indoors until it feels like the walls are closing in. For parents, getting your children outside to play is one of the best methods to treat this common disorder. Snow and ice offer plenty of opportunities for fun. Ice skating, sledding, skiing and snowboarding are all great ways to enjoy the outdoors. However, winter comes with a set of dangers. Dr. N. MariamShair, a pediatrician at OSF HealthCare Medical Group – Belvidere Primary Care, has culled some tips from healthychildren.org, the website for the American Academy of Pediatrics, to help you keep your children safe during common winter activities. First, check the weather forecast for any severe cold or severe weather advisories before letting children outside to play. Also, set reasonable time limits to prevent hypothermia and frost bite. Make sure children come inside periodically to warm up. Every 15 minutes is a good baseline. Children should always be supervised while playing outside in the winter. They should wear layers and, preferably, waterproof outer layers, like snow pants, boots and gloves. Babies and small children should generally wear one more layer of clothing than an adult would wear in the same situation. Make sure snowballs are made from actual snow and not from ice, and are not thrown at anyone’s face. Sunglasses are recommended during sunny days, because the snow reflects the light and can cause snow blindness. Only skate on approved surfaces. If you’re going to skate on a surface that is not a man-made ice rink, like a pond or lake, check for signs posted by the local police or recreation department declaring the surface approved for skating. Before going to spots like this, you can check the local police department Facebook page or call them to check on the safety of a given location. Encourage children not to dart across the ice. Make sure children skate in the same direction as the crowd to help avoid injury. Children shouldn’t eat or chew while skating. It’s a choking hazard. Consider using a helmet, knee pads or elbow pads, especially if your child is not a great skater. Stay away from cars and roadways. Keep younger children separate from older ones, because older kids generally like to do more daring stuff that can be dangerous for smaller children. Sledding feet first or sitting up is safer than face first. It prevents head injuries. 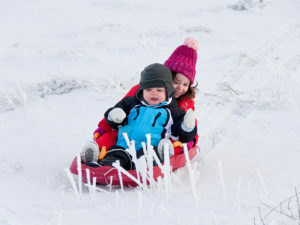 Make sure sleds are structurally sound, with no sharp edges or splinters. Slopes should be free of obstructions like trees or fences, covered in snow, not too steep and should have a flat run-off area at the bottom that provides room to slow down. Use eye protection like goggles. Avoid areas with trees and other obstacles. Children under 16 should not operate snowmobiles, and children under 6 shouldn’t ride them at all. Never use a snowmobile to pull a sled or skiers. Wear goggles and a safety helmet approved for motorized vehicles like motorcycles. Snowmobiles should be operated at safe speeds and never driven alone or at night. Snowmobilers should stay away from roads, water, railroads and pedestrians.